Last year, I have already started organizing our baking tools and equipment. We have designated a pantry cabinet for our baking supplies but it seemed that the space cannot accommodate the growing number of our baking tools and in fact, we are still planning to purchase more since we are using this for our cup cake business. 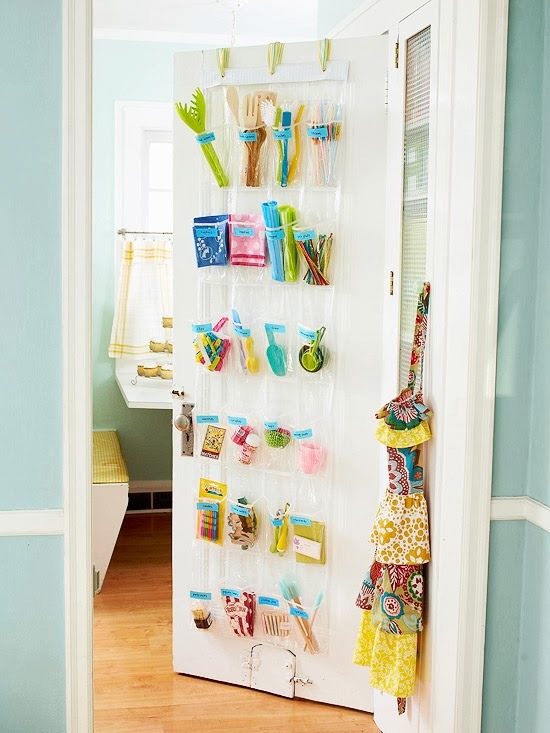 I've seen this DIY kitchen organizer and I found it really helpful to organize kitchen stuff especially those small baking tools. My usual problem when I start baking is to look for the small fondant cutters, measuring spoons and cups as these were very small pieces of tools tucked somewhere in the baking pantry cabinet, so I guess organizing it this way will help me save a lot of time looking for things. I'm really excited to have this done. This is actually a shoe organizer which can be used for other purposes such as the one mentioned above. A proper labeling is all you need to have your kitchen tools really organized.